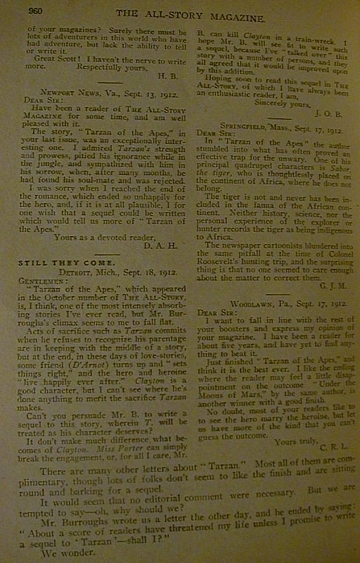 Tarzan of the Apes was first published in the October 1912 edition of The All-Story Magazine. The story was immensely popular with All-Story readers and generated a flood of letters. 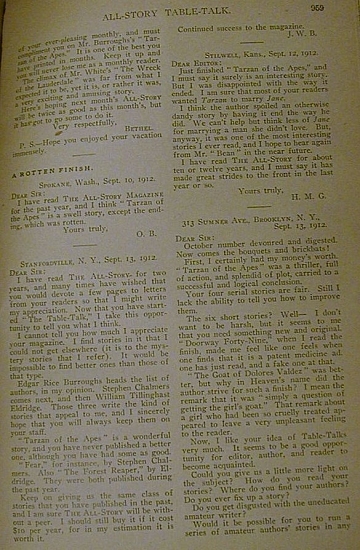 Many of these letters were published in the magazine's letters to the editor section: "Table Talk." 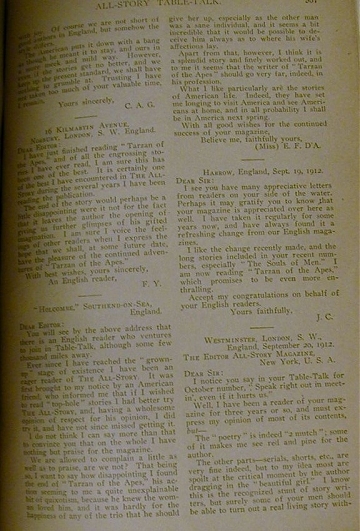 To give some idea of the story's popularity we feature some of these letters in this edition of ERBzine. We said last month that we were going to be honest; what follows is going to prove it. It is a confession. When the manuscript of "Under the Moons of Mars" came to us, the name signed was Normal (with an "L") Bean. When we came to run the story -o- from enthusiasm or some other worthy sentiment -- we beefed it and called the author Norman Bean. Very likely there is noting so soul-searing as a misprint. We saw a man last Sunday whose entire day was ruined by a compositor's mistake. However, Mr. Bean was very decent to us; and then we found out that his real name wasn't Bean anyway. Really he is Edgar Rice Burroughs; and he does some important business stunt or other in Chicago, using the name Bean. Considering the general mess we made of his nom-de-plume, it has been decided by all hands to return to his real name; and in October when his next story will appear, things will be fixed up so that every one will know that Norman bean and Edgar Rice Burroughs are the same author. Tarzan of the Apes is the name of Mr. Burroughs' new novel. We are going to give it to you all at once. It's a crackerjack. If you will stop and realize how many thousands and thousands of stories an editor has to read -- day in, day out -- you will be impressed when we tell you that we read this yarn at one sitting and had the time of our young lives. It is the most exciting story we have seen in a blue moon and about as original as they make 'em. Through a series of catastrophes an English boy is kidnapped by a tribe of huge anthropoid apes. He grows up among them. The fact that he is a reasoning animal makes a difference in his development, and then the forces of civilization obtrude. Zowie! But things happen! You know what a good story "Under the Moons of Mars" was and how Mr. Burroughs' imagination got loose and did whatever it wanted to -- well, the same thing has happened again; so you may bet yourself anything you want that you'll miss something excellent if you don't see the new yarn. We have a number of letters about the Mars story. We'll print just one which makes us feel cheerful, and then talk of something else. I have read THE ALL-STORY now for many years. The first story I ever read was "Hurricane Hill," if I am not mistaken. Have just finished the new fifteen-cent edition and it is far beyond competition. "The Red Book of Mystery" was fined. The first thing I do when I get the good old ALL-STORY is to read the serials. Pat Norman Bean on the back and tell him to push in some more tales like "Under the Moons of Mars." That is the best story I have seen in many years. The other serials have excellent material in them. Would like to read a serial pictured in Oregon. We of the "woolly West" appreciate good stories and gladly hail them. Be a booster. I sometimes see a story I don't care for, but simply pass it by. Your October number of All-Story is fine. Let me send you the voice of hundreds of soldiers here for Norman Bean, or, in his correct name, Edgar Rice Burroughs', and his great story of "Tarzan of the Apes." Everybody's talking about it, and every one thinks it's great. 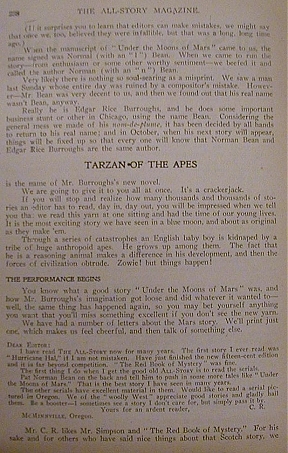 Some say that Bean should write another about "Tarzan" because he lost the girl, while others wonder if he can get used to living in civilization. What about it, Mr. Editor? The Soldiers of the 10th Inf. U.S. Army. *Burroughs' first work, Under the Moons of Mars, was published under the pseudonym 'Norman Bean': Burroughs had wanted the name to read 'Normal' Bean, but a typographic error was introduced. Afterwards, he published almost exclusively under his full name. I thought I would write and tell you what I thought of E. R. Burroughs' masterpiece in the October All-Story, "Tarzan of the Apes." I think it is the best magazine story ever written. It was simply swell. I read a good many magazines, and it is the best story I ever read. I have just finished reading "Tarzan of the Apes," and to say that it is the best story I ever read would be putting it mildly. It is full of life and action, besides being unique in its plot. 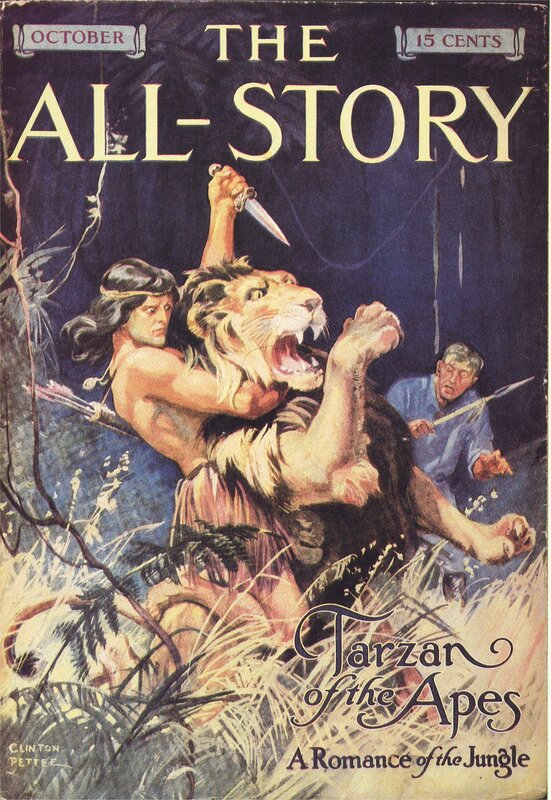 I did not lay down the magazine until I had finished "Tarzan," and since then I have been trying to figure out what Tarzan did after he was refused by Jane Porter. It seems against human nature that he should declare that his mother was an ape just after it had been proven that he was a man. What did he do? Did he go back to the jungle or remain in civilization? The story is so engrossing that I am burning to find out what became of him. Cannot you persuade the author to write a kind of sequel? I know many of the other readers feel as I do. That story was the "best ever." 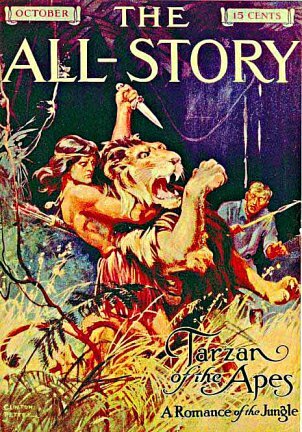 I have read THE ALL-STORY MAGAZINE for the past year, and I think "Tarzan of the Apes" is a swell story, except the ending, which was rotten. Have been a reader of THE ALL-STORY MAGAZINE for some time, and am well pleased with it. 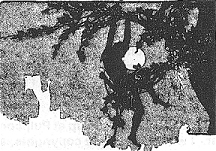 The story, "Tarzan of the Apes," in your last issue, was an exceptionally interesting one. I admired Tarzan's strength and prowess, pitied his ignorance while in the jungle, and sympathized with him in his sorrow, when, after many months, he had found his soul-mate and was rejected. I was sorry when I reached the end of the romance, which ended so unhappily for the hero, and, if it is at all plausible, I for one wish that a sequel could be written which would tell us more of "Tarzan of the Apes." "Tarzan of the Apes," which appeared in the October number of The All-Story, is, I think, one of the most intensely absorbing stories I've ever read, but Mr. Burroughs's climax seems to me to fall flat. Acts of sacrifice such as Tarzan commits when he refuses to recognize his parentage are in keeping with he middle of a story, but at the end, in these days of love-stories, some friend (D'Arnot) turns up an d "sets things right," and the hero and heroine "live happily ever after." Clayton is a good character, but I can't see where he's done anything to merit the sacrifice Tarzan makes. Can't you persuade Mr. B. to write a sequel to this story, wherein T. will be treated as his character deserves? It don't make much difference what becomes of Clayton. Miss Porter can simply break the engagement, or, for all I care, Mr. B. can kill Clayton in a train-wreck. I hope Mr. B. will see fit to write such a sequel, because I've "talked over" this story with a number of persons, and they all agreed that it would be improved upon by this addition. magazine is appreciated over here as well. I have taken it regularly for some years now, and have always found it a refreshing change from our English magazines. I like the change recently made, and the long stories included in your recent numbers, especially "The Souls of Men." I am now reading "Tarzan of the Apes," which promises to be even more enthralling. Accept my congratulations on behalf of your English readers. I do not think I can say more than that to convince you that on the whole I have nothing but praise for the magazine. We are allowed to complain a little as well as to praise, are we not? That being so, I want to say how disappointing I found the end of "Tarzan the Apes," his action seeming to me a quite unexplainable bit of quixotism, because he knew the woman loved him, and it was hardly for the happiness of any of the trio that he should give her up, especially as the other man was a sane individual, and it seems a bit incredible that it would be possible to deceive him always as to where his wife's affections lay. Apart from that, however, I think it is a splendid story and finely worked out, and to me it seems that the writer of "Tarzan of the Apes" should go very far, indeed, in his profession. I have just finished reading "Tarzan of the Apes," and of all the engrossing stories I have ever read, I am sure this has been one of the best. It is certainly one of the best I have encountered in THE ALL-STORY during the several years I have been reading the publication. The end of the story would perhaps be a little disappointing were it not for the fact that it leaves the author the opening of giving us further glimpses of his gifted imagination. I am sure I voice the feelings of other readers when I express the hope that we shall, at some future date, have the pleasure of the continued adventures of "Tarzan of the Apes." In "Tarzan of the Apes" the author stumbled into what has often proved an effective trap for the unwary. One of his principal quadruped characters is Sabor, the tiger, who is thoughtlessly placed on the continent of Africa, where he does not belong. The tiger is not and never has been included in the fauna of the African continent. Neither history, science, nor the personal experience of the explorer or hunter records the tiger as being indigenous to Africa. The newspaper cartoonists blundered into the same pitfall at the time of Colonel Roosevelt's hunting trip,* and the surprising thing is that no one seemed to care enough about the matter to correct them. Ed. : Theodore Roosevelt, the twenty-sixth president of the United States, went on safari in AFrica in 1900, just after the end of his presidency. I want to fall in line with the rest of your boosters and express my opinion of your magazine. I have been a reader for about five years, and have yet to find anything to beat it. Just finished "Tarzan of the Apes," and think it is the best ever. I like the ending where the reader may feel a little disappointment on the outcome. "Under the Moons of Mars," by the same author, is another winner with a good finish. No doubt, most of your readers like to see the hero marry the heroine, but let us have more of the kind that you can't guess the outcome. I have read your October "Table-Talk." It is good. I can appreciate better now why the Munsey publications are such a success. I bought an October ALL-STORY at Wichita, enroute to Lawrence. I began to read "Tarzan of the Apes." My university friends with me upon the train promptly pronounced me a "grouch." For the story fascinated me such that the football and the old frat were simply overshadowed. I reached Lawrence only half-way through "Tarzan of the Apes." There I received a wire to return to Kiowa, Kansas on a business matter of my father's. I forgot to slip the October ALL-STORY into my grip. At the depot I missed it and tired to purchase another. They were sold out. I rushed up town only to find the news-depots with none unsold. The train news-boy and the Fred Harvey stands* for three successive stops were unable to supply me. After two hundred miles of chafing I found a solitary copy at Wichita. I finished the story. At Wellington I discovered two more copies of your magazine for October. I bought them both. I slashed the less desirable half of the remaining pages from the binders. At Harper I mailed three rolled "Tarzan of the Apes" to as many friends. I was afraid they might have missed a good thing. After all of this 'tis useless for me to say that I think the story more than ordinarily good. When I had finished the article I felt the keenest sorrow for Mr. Burroughs's "Tarzan of the Apes." No -- he had become my Tarzan. For several seconds I sat deeply touched. Further, if you will bear a moment more, after "Tarzan of the Apes," my appetite for further reading failed me. "The Spaniard"** looked uninteresting beyond expression. I felt sorry, indeed, for the author of an article which was destined to follow "Tarzan of the Apes" (for I've written a bit myself). But imagine my surprise when, as I hastily ran over Mr. Comstock's little narrative, I found my already overflowing imagination absorb every thought, and when I had finished, crave for more. * Fred Harvey created the first US restaurant chain, which was tied to the rail-lines, and also offered news-stand services. There are so many stories in The All-Story I like I cannot single out any particular few for preference! But "Tarzan of the Apes" was, as my brother would say, "a dinger." But when the end of a story would make a lady swear, that's some provoking. Jane wasn't far from an "Ape-a-renas" herself. But Tarzan had left Ape-dom behind, and she admits she loves him! Was it because he was still a monkey that Tarzan let go all holds and let the other fellow have the whole basket of peaches? I hope Tarzan goes back to the island and stays there. The rest of the story was so good, except the end. I'm only mad at Tarzan, Mr. Bean, so come again soon; shall be watching for you, sir! Also John D. Swain and Ella B. Argo* -- I may as well include the rest I like them all. Mrs. A. C. P. F.
I have just finished the complete book in the October issue, entitled "Tarzan of the Apes," and never saw anything in print that could get on the same block with it up to the last page -- but gee! -- the finish is rotten. There are many other letters about "Tarzan." Most all of them are complimentary, though lots of folks don't seem to like the finish and are sitting around and barking for a sequel. It would seem that no editorial comment was necessary. But we are tempted to say -- oh, why should we? Mr. Burroughs wrote us a letter the other day, and he ended by saying: "About a score of readers have threatened my life unless I promise to write a sequel to 'Tarzan' -- shall I?" THE GODS OF MARS is coming out as a serial. It will run for several months, and so we all may rest assured of some extra fine reading stuff by "Battling" Burroughs" for some time to come. This yarn is a sequel to "under the Moons of Mars," of never-to-be-forgotten popularity. The author's imagination again riots over the periphery of our terrestrial neighbor. Once more we play with thoats and snarks (sic) and so forth, and six-legged gents, and the scientific paraphernalia that can exist nowhere except on Mars where, as we learn from our savants, "they do those things better." Most every one like "Under the Moons of Mars," though we remember a couple of chaps who sent us severe reprimands for printing it. We have to beg their indulgence and we know they will be lenient with us for that we are enthusiastic. So many other folks were that we caught it. Maybe if those chaps who didn't like Mr. Burroughs' first Martian yarn will try his second, they too will get the hunch that, taking it for better and worse, it is darn good original stuff. We should be willing to offer a prize to any hombre that could do better. 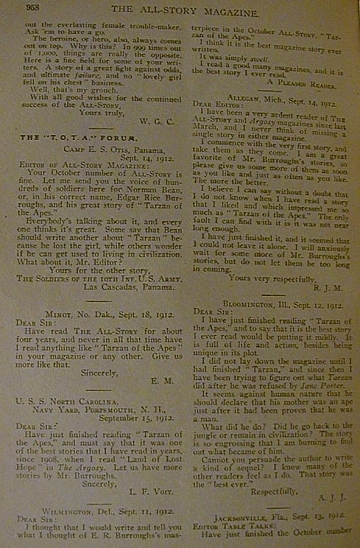 Dear Sir: Have read the All-Story for about four years, and never in a ll that time have I read anything like "Tarzan of the Apes" in your magazine or any other. Give us more like that. I thought that I would write and tell you what I thought of E. R. Burroughs' masterpiece in the October All-Story, "Tarzan of the Apes." I think it is the best magazine story ever written. I read a good many magazines, and it is the best story I ever read. 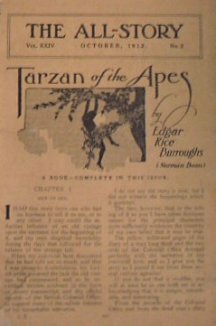 Have just finished reading "Tarzan of the Apes," and must say that it was one of the best stories that I have read in years, since 1908, when I read "Land of Lost Hope" in THE ARGOSY. Let us have more stories by Mr. Burroughs. I am a great favorite of Mr. Burroughs's stories, so please give us some more of them as soon a s you like and just as often as you like. The more the better. I believe I can say without a doubt that I don not know when I have read a story that I like and which impressed me so much as "Tarzan of the Apes." The only fault I can find with it is it was not near long enough. 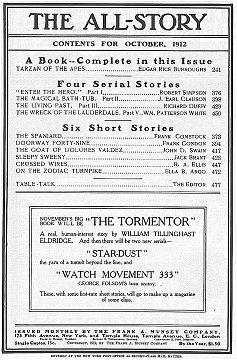 Have just finished the October number of your ever-pleasing monthly, and must compliment you on Mr. Burroughs' "Tarzan of the Apes." It was one of the best you have printed in months. Keep it up and you will never lose me as a monthly reader. "Tarzan of the Apes" is a wonderful story, and you have never published a better one, although you have had some as good. Just finished "Tarzan of the Apes," and I must say it surely is an interesting story. But I was disappointed with the way it ended. I am sure that most of your readers wanted Tarzan to marry Jane. I think the author spoiled an otherwise dandy story by having it end the way he did. We can't help but think less of Jane for marrying a man she didn't love. But anyway, it was one of the most interesting stories I have ever read, and I hope to hear again from Mr. "Bean" in the near future. 313 Sumner Ave, Brooklyn, N.Y.
October number devoured and digested. Now comes the bouquets and brickbats! First, I certainly had my money's worth. "Tarzan of the Apes" was a thriller, full of action, and splendid of plot, carried to a successful and logical conclusion. Tarzan of the Apes entry in ERB C.H.A.S.E.R.